Sim, Clare and Bert at one of VicForests’ coupes. On a recent tour of logging coupes in the Strathbogie Forest, Clare Malcolm, Labor Candidate for the new electorate of Euroa, confirmed she would support the local community’s call for a comprehensive investigation of land-use in these forests by the Victorian Environment Assessment Council. VEAC’s predecessor, the Land Conservation Council, Victoria, last investigated land use in this region in the 1980’s! Since that time there have been substantial changes in forestry techniques, status of threatened species, recreational use, Government policy affecting forest management, among others. Two members of the Strathbogie Sustainable Forest Group, Sim Ayres and Bertram Lobert showed Clare some of the coupes VicForests plans to log in the next few years, as well as what a logged coupe can look like when everything goes terribly wrong. Bert and Clare survey the catastrophic damage in this VicForests coupe on Barjarg Rd. A double-whammy. After eight years of failure, VicForests is trying something new in the coupe at the corner of Barjarg Rd & Ferraris Tk (411-504-0002). In the past they’ve wind-rowed, burnt, scalped, maybe even seeded the coupe – not only have these attempts failed, they’ve made natural regeneration of a healthy, biodiverse forest in the coupe near-impossible – at least for many decades. 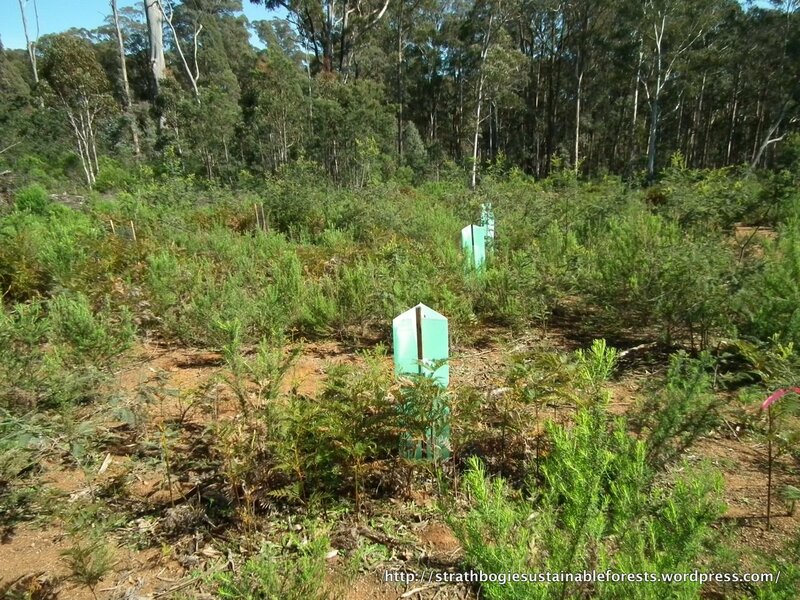 VicForests’ most recent attempt is a trial planting of seedlings of several species of eucalypt in the coupe to test the effectiveness of different types of guards. The browsing impact of Black Wallabies and Rabbits on juicy seedlings is likely to be high, so guarding any planted seedlings is a must. The results of the trial will indeed be interesting, but the method appears flawed. Regenerating trees using nursery-grown seedlings is one thing, it may grow a crop of trees, but that won’t regenerate the forest. The trial doesn’t appear to include any ground-layer or understorey species, though that could be part of a bigger, subsequent trial. And given the community’s involvement in and concern about this whole issue, it’s disappointing that the community hasn’t been involved or even informed. To the best of our knowledge the trial includes five treatments (guard types) set out in rows, with about five replicates per row. It’s a small trial to start with and the placement of treatments isn’t randomized, which precludes meaningful statistical analysis of results. It makes you wonder how serious this trial is – perhaps not at all. How extensive and long-term is the trial? Will the trial include a diversity of species, representative of the original forest? Was there input from DEPI/other ecologists about the methodology behind the trial? What question/s is the trial addressing and how will the trial be assessed? Will the trial and the need for any subsequent coupe-scale revegetation activities be taken into account in a profit-loss assessment of these forestry operations? Regardless of the outcomes of the trial, in principle we’re opposed to large-scale, tree-only revegetation of this coupe, as it will result in the transformation of a natural forest into a forestry plantation. Perhaps the effort VicForests have put into this little trial reflects their concern about forest conservation generally? A couple of weeks ago twenty-odd people enjoyed an evening in the Strathbogie State Forest. First and most important, Sim got a lovely campfire going while the light faded – no point starting a night walk before our nocturnal quarry becomes active. Then we enjoyed a variety of delicious soups: minestrone, ox-tail, spicy pumpkin … Oh, they were delicious! But the best was still to come. We split into two groups, each with several spotlights and torches, then went looking for nocturnal fauna. The area surveyed included Damp Forest in the Parlours Creek valley and Herb-rich Foothill Forest on the slopes and along Lima East Rd. The locations we surveyed are all slated for logging in the next few years. The forest along Parlours Ck is rich and still has a number of big, old trees. We saw nine Greater Gliders – the largest of Australia’s nine gliding possums, which has a completely vegetarian diet of eucalypt leaves. We also saw and heard a number of Southern Boobook Owls, several Common Ringtail Possums AND several Koalas! Forest microbats flew above our heads as we walked. It was a most successful evening – some pics below to illustrate the species recorded.